Bethesda's E3 conference this year kicked off with what is one of the most anticipated games of this year, DOOM. After spending years in development limbo, the developers dropped the "4" from the original working title and presented the game as just DOOM. Following the gameplay reveal at the conference, I felt like I was time-warped back to 1993, with critics labeling the presentation disturbingly hyper-violent and effectively resurrecting the same arguments that were slapped across the face of the original title at the time of its debut. The controversy is a characteristic that The Escapist's own Joshua Vanderwall said is as much a part of the DOOM DNA as the violence itself, and I have to agree. How else would a franchise with as much age behind it as DOOM manage to still evoke the emotion that it did in 1993 so many years later? Control is the most basic and integral component of any video game. A player controls when to push play, where to move, how to react, and when to quit. It was with the addition of first person perspective that consumers received the certainty of physical control along with a sense of control and increased involvement within the game itself. When the first person perspective merged with games that had twitch gameplay, violence, and a visceral deviation from real life the perception of total control was strengthened. 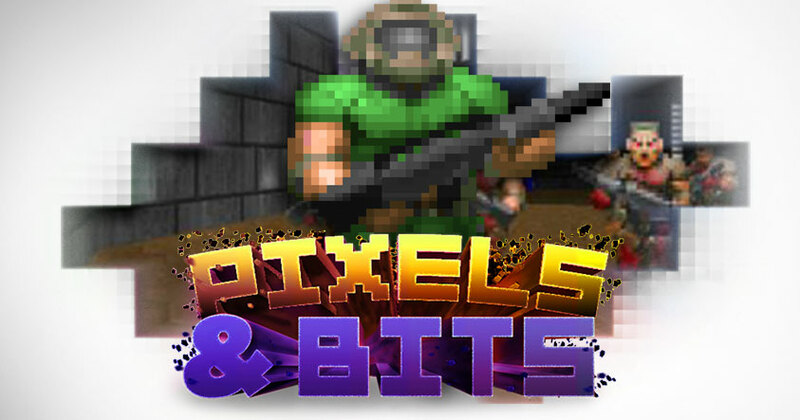 The merger of the two supported the introduction of the First Person Shooter (FPS) game. While 1992's Wolfenstein 3D was widely credited with inventing the First Person Shooter (despite examples dating back to the early 1970s), mainstream popularity came one year later, with the release of the classic title DOOM. DOOM, in all its bloody majesty, was the first time many people had seen a first person shooter. It is also often credited with being one of the early pioneers of "realistic" video game violence, with CNN listing it as the third most controversial video game of all time in 2011. The player navigates through military bases, power plants, and sectors of Hell, battling a seemingly neverending horde of zombies, flaming skulls, and demonic henchmen. Upon completion of the third episode, the player enters into a brutal standoff against Spiderdemon, a massive cyborg brain creature with a built in chaingun. The main character in DOOM was never named. This was an intentional omission by the game's designer, John Romero, with the intention that the player would feel like the marine was them. DOOM is justifiably hailed as one of the most significant video games of all time - so much so that in the years following its release, the games within the FPS genre were unofficially renamed "Doom Clones." 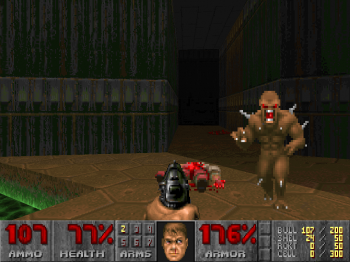 In addition to its groundbreaking weapon arsenal and innovative design, DOOM's notorious combination of "satanic imagery" and graphic violence drew criticism from both religious communities and several self appointed moral watchdog groups, even becoming a point of contention 6 years after its release during the Columbine school shooting. These controversies helped shape the way in which the industry as a whole would handle vocal detractors and inspired multiple studies questioning, and effectively disproving, a link between violence in video games and real world violence. The controversies surrounding DOOM arguably spearheaded the discussion of creative freedom and the willingness to view video games as an artistic medium. In DOOM, the player was provided with the feeling of control, as well as the illusion of agency, within the gaming experience. While many games laid the necessary technical foundation prior to its release, DOOM not only reinvented First Person Shooter gaming, it was a solid catalyst for the acceptance of, and subsequent demand for, similar games. The controversy surrounding DOOM lives on, and is arguably one of the top reasons the demand for the title has stayed so strong. It is easy to find a game that evokes an intense emotional reaction. It is much rarer to find a game that, despite the passing of more than two decades, has managed to retain not only its influence, but also its relevance, to the industry and customers alike.